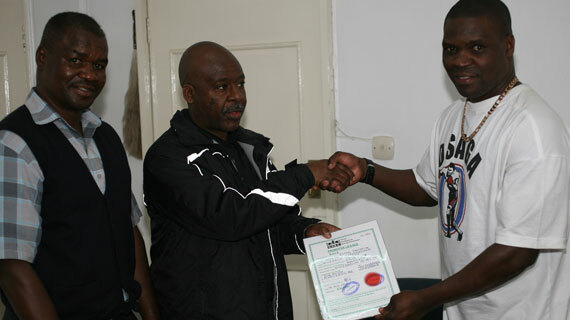 Caleb Kuya of Osaga Promotions license has been reinstated by the Kenya Professional Boxing Commission (KPBC) after long standing issues between the national boxing regulation body and him were resolved. KPBC chairman George Athman said Kuya’s suspension period has elapsed and all issues solved , he said the above is now free to engage back in all boxing activities in the country. Kuya was apparently suspended and his license revoked by KPBC two years ago following sharp disagreements between him and boxers under his stable with most boxers complaining about lack of honoring pledges on the promoter’s side. Kuya was handed KPBC rules and regulations to follow with a surety of a suspension should he violate them. Kuya said all is now water under the bridge and that he’s starting all over again on a clean platter. The 39 year old promoter who has promoted fights in Europe and Asia said he’s quite happy to return to the Kenyan market since no one has been able to stage valuable international fights since his departure from the local boxing scene. He’s currently seeking for American opponents for regional bantamweight champion Fatuma Zarika and Judy Waguthi for title fights. Among the top bouts Kuya has ever staged in Kenya include WIBF middleweight title pitting Conjestina ‘Hands of Stone’ Achieng against Uganda’s Fiona Tugume and that of Fatuma Zarika against Elena Tisen of Germany. Meanwhile, KPBC will stage a seminar soon to educate veteran and upcoming promoters on how to stage and market boxing Kenya.